People say the toddler years can be the absolute worst years, calling them they “terrible two’s” riddled with tantrums. One way to try to get around this issue would be to give your child a nap and make sure he or she is getting enough sleep each night. Your child’s sleep is important, and you should take into consideration where your child is sleeping and what your child is sleeping on. Your child’s room should be conducive to sleep, not to bright or noisy and not too hot either. Make sure you are using pillows and blankets that are made for toddlers, not for babies or older children. 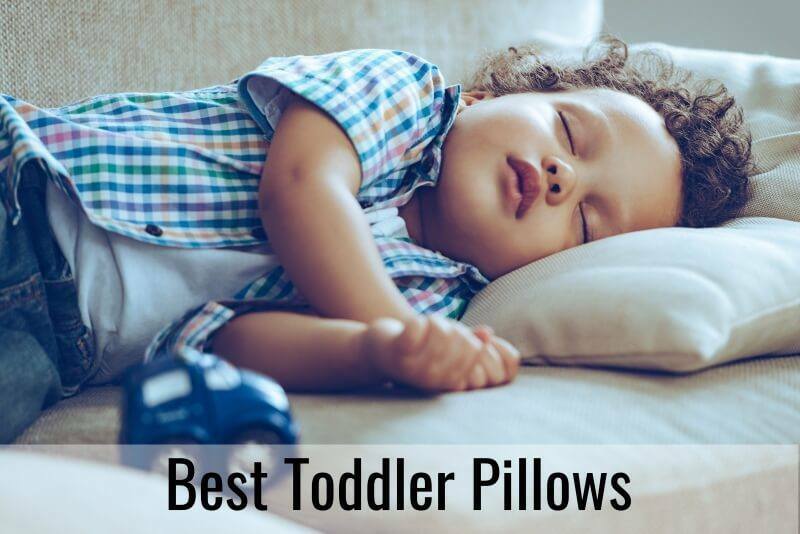 This list is filled with pillows that are toddler size, hypoallergenic and made to be comfortable and very supportive for your precious child. Made in America: When things are made locally you know and trust the standards they are held to, that’s why I chose pillows that are crafted in the US. Hypoallergenic: Your little one’s need to get the best rest they can, so I chose pillows that are hypoallergenic to keep the allergens and irritants out of your child’s airways. Machine washable: Let’s face it, kids are messy and sometimes they have accidents which means that you need to be able to clean the pillow easily, so I chose machine washable pillows for you and your family. 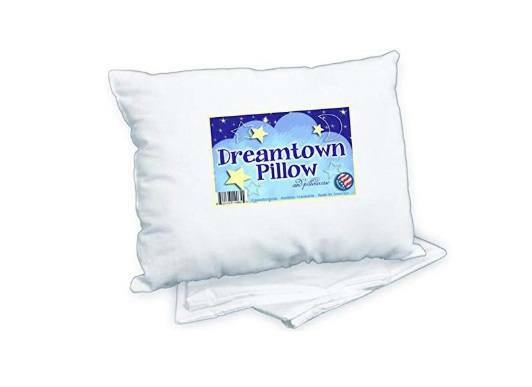 Dreamtown kids pillow is an American made pillow that is created with children in mind, by a family run business, to best work with their little bodies. 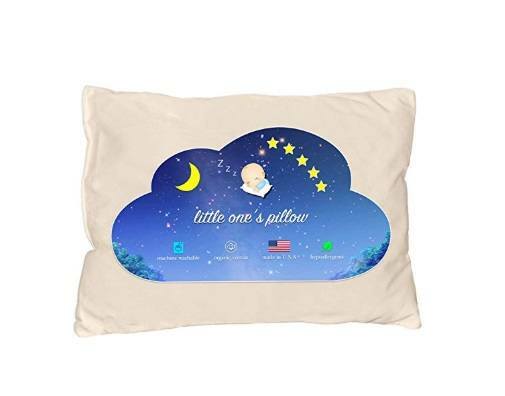 The pillow is the perfect size for your little one, not too big or fluffy that it will smother him or her, and not too small their little heads will slip off the pillow. The pillow is covered in a casing made from a poly-cotton blend that you can machine wash without any issue. 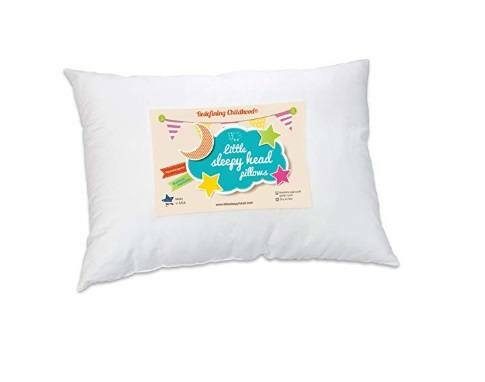 If you are worried about your little one having a rough night in bed, this might be a good pillow as it comes with a recommendations from chiropractors. Children from the age of two years old and older are recommended to use this pillow, so make sure you are not buying it for a younger child. Lastly, the company knows that where your child lays his or her head at night is of huge importance as they may spend eight to ten hours with their face against the surface of the pillow. Because of this, Dreamtown Kids has created their pillow to be not only hypoallergenic, but also mold and mildew resistant. It is made without harsh chemicals and heavy metals from the beginning of the process, to the packaging and getting it to your house safely. This is another American made product developed by Little Sleepy Head company and I start with that point because you know what standards american factories are held to so you can trust the work. Their pillow is perfectly sized for toddlers so that they can use it not just at home but on the road and with them to daycare or grandma’s. 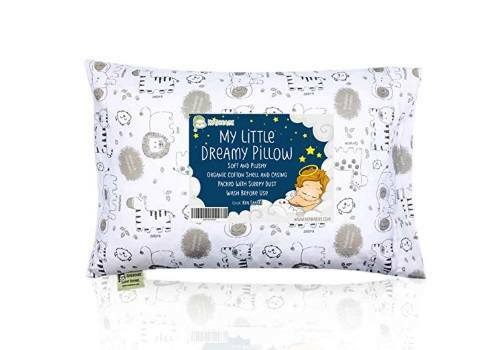 The pillow is made in an allergen free factory and is hypoallergenic to keep any allergens or irritants away from your child while he or she is sleeping. The inside is made from polyester fiber and is covered in a 100% cotton case that can be easily washed or spot cleaned. The company making these pillows is family run and knows the values of a family and the importance of protecting your child. The pillows is hypoallergenic and kid friendly, so even when it gets dirty, you can wash it simply in the washing machine. From the process of gathering materials to creating the and stuffing the pillow, to sewing it closed, to packing and shipping the pillow to you, this American made pillows is made without harsh chemicals. You child can use this pillow every day and every night without you worrying that he or she is breathing in things that can be harmful. The pillows are the perfect size for your toddler, not too small or too big, too fluffed and high or flat, and you can even ask for customizing the pillow to fit what you think the specific needs are. You can wash the pillow in the machine and leave it out to dry or spot clean it with a warm, wet towel. The pillow is filled with propriety cluster fiber filling and is wrapped up with care in a 100% cotton case that is both durable and breathable. The pillows should last you through the toddler years and perhaps onto the next child as they are expected to stay in good condition and quality from between three to five years. 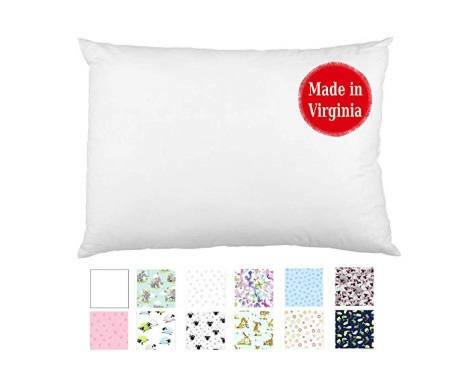 This is a Virginia made toddler pillow of high quality and comes with glowing recommendations from other parents. What is fun about these pillows is that you can choose the pattern, color and design from a range of twelve different options. This product is perfect for two year olds but can be used for anyone over the age of two, just note the size is small. It is a hypoallergenic pillow and is made without those chemicals that you do not want next to your little one’s face all evening. The pillow is cotton and easy for you to keep clean with a hot, wet towel or by using the washing machine to keep the entire pillow clean. The cover of the pillow is stitched not once, but twice to ensure that the pillow will stay together and last despite the way your toddler uses it or carries it everywhere. This is a child friendly and child favorite pillow that can be purchased either in plain white or with a safari design on the outside. It is machine washable and easy for you to pop in the washer once in awhile though overwashing may cause damage. There is a long warranty on these pillows in case you are not fully satisfied, while many companies have a 30 day warranty, this one is a full 365 days. It is a hypoallergenic option to give you child freedom to breathe without worrying of allergens irritating his or her body. These pillows are very durable and will last you well through the toddler years and then some if you take care of them. They are also ergonomically designed not just to be comfortable but to truly support the weight of your baby’s head and neck. The pillows you choose should not be too fluffed, too high or too soft and flat, they should be a happy medium. If your child’s pillow gets a bit dirty, make sure you put it in the washer, though you are warned not to wash them too often as it can make pillows lumpy. Taking care of your toddler’s sleep is one of your biggest responsibilities as a parent as sleep is what determines how much energy your child will have. Do your best to provide the proper environment for your child to get a good night’s rest.